https://matcha-jp.com/en/6967 10 Winter Things To Do In Japan - Hot Springs, Festivals, And Glistening Snow! 10 Winter Things To Do In Japan - Hot Springs, Festivals, And Glistening Snow! Winter weather starts in December and ends around March in most regions of Japan. There are many things to enjoy in this chilly season. Read this article to learn about 10 exciting things that will warm up your winter! Dive into Winter in Japan! Along with its cool temperatures, Japan's winter offers everything from relaxing hot springs and thrilling winter sports to delicious cuisine. Visitors can also enjoy the coziness of the indoors, the clear skies and ideal weather outside. This article introduces 10 things you can look forward to during the beautiful cold season. Bathing in an onsen, or natural hot spring, is a highly-recommended activity in Japan during any time of the year. Winter, in particular, is a great time to take a dip and warm up at the end of a cold day. Here are suggestions for onsen where you can gaze out at the snowy scenery as you bathe, either through a window or by being in an outdoor bath. Ginzan Onsen in Yamagata Prefecture is a renowned hot spring town with high-quality springs and snow piled tall. The inn architecture and bright red bridge are said to resemble that of Studio Ghibli’s "Spirited Away". 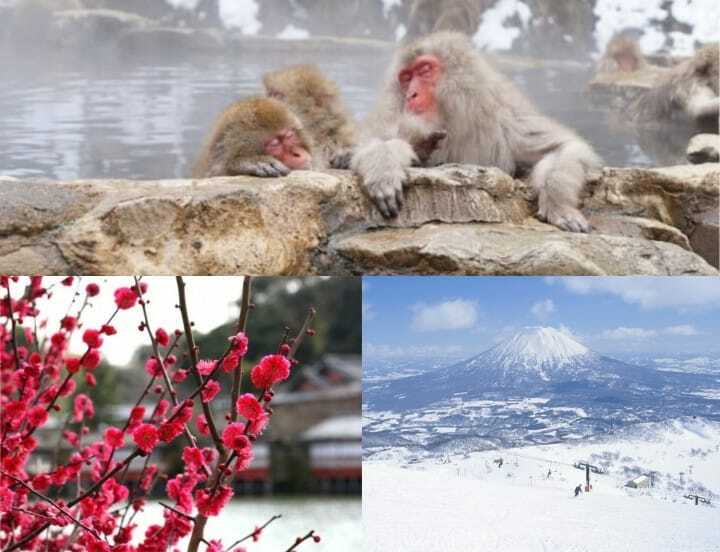 In Nagano Prefecture in central Japan, Shibu Onsen, is a popular hot spring known for its adorable snow monkeys bathing in the onsen at Jigokudani Wild Monkey Park. After quietly observing the monkeys, you can warm up too in the nearby hot springs district. In western Japan, the picturesque hot spring district in Kinosaki Onsen in Hyogo Prefecture becomes blanketed with snow in the winter. It is easily accessible from Kyoto, Osaka, and Kobe. After a full day of traveling in the cold, make sure to unwind and warm up in the relaxing water! 2. Go Skiing and Snowboarding! In Hokkaido, Niseko is internationally renowned for its good quality snow and great slopes. There is also Sapporo Kokusai Ski Resort, which is conveniently accessible from the city of Sapporo. GALA Yuzawa Snow Resort in Niigata Prefecture is just 75 minutes via bullet train from Tokyo and is a popular choice for enjoying winter sports. Nagano Prefecture is also famous for its slopes. Whether you are a beginner or a seasoned winter sports athlete, these resorts are great for warming up your body through exercise and enjoying the snowy scene. Another way to have fun in the snow is to take in the phenomenal landscape that forms naturally. Venture beyond major cities and you will be able to discover how stunning the outdoors are in the winter. North in Zao, Yamagata Prefecture (pictured above), mysterious hoarfrost on the trees appears from late December to March. Visitors can view this magical scene from a ropeway that operates during the day and night. In addition, the JR Tadami Line that connects Niigata Prefecture and Aizuwakamatsu in Fukushima Prefecture is a spectacular train ride to take in the winter months. The surrounding ice and snow-covered landscape is a once-in-a-lifetime experience and is sure to take your breath away. Another must-see is the UNESCO World Heritage site of Shirakawago Village in Gifu Prefecture, central Japan, which transforms into a romantic snowy scene in the winter. The thatched roofs of the traditional Japanese huts get covered in a thick, sparkling white snow. Bundle up and go explore Japan's great outdoors in the snow! Illuminations in Japan are often associated with the Christmas season, but they usually last the entirety of winter. These types of light up displays are common around train stations, shopping areas, and city streets. Amusement parks, including Tokyo Disney Resort also have illumination installments, so if you are looking for something fun and romantic, make sure to stay until the evening! If you like art, put the Sapporo Snow Festival on your travel itinerary. Sapporo brings in countless visitors annually for its snow festival, in which three areas of the city feature huge snow and ice sculptures created by talented artists. Previous years have featured everything from castles to scenes from popular works like "Attack on Titan" and "Star Wars" recreated out of ice. There are colorful illuminations at night which create an even more magnificent scene. In 2019 the Sapporo Snow Festival will be held from February 4 to February 11. This is an event not to miss if you are in Japan during this time. The Sapporo Snow Festival 2019 - An Extravaganza Of Snow And Ice! Picture from Shabu-Shabu, Sukiyaki, Hot Pot: The Differences, Recipes, And More! Savoring some hot pot cuisine at the end of the day is one of the best pleasures during winter. Japan has shabu-shabu, sukiyaki, and nabe, which are all body-warming hot pot dishes with hearty meat, seafood, and vegetables. Nabe and sukiyaki are commonly made in homes in Japan. If you go to a supermarket, you will often find packages of vegetables and meat for the purpose of making nabe. These are easily prepared and customizable to different tastes. Shabu-shabu, on the other hand, is more common to enjoy when dining out. This type of dish is fun for sharing with a group of friends or family, as diners can actively participate in making their own food. After cooking the ingredient briefly in the flavored stock, you can add flavor by dipping it into a citrus flavored or sesame flavored sauce. These hot pot dishes are filled with wholesome ingredients, taste exquisite, and will warm your entire body. Make sure to experience this traditional cuisine in the wintertime! Enjoy the Japanese Winter by Eating Nabe, a Tasty Hot-Pot Dish! Shabu-Shabu In Tokyo - 4 Spots To Enjoy This Delicious Hot Pot Dish! There is no shortage of tasty ingredients and fruit in the winter. One of the most famous winter foods in Japan is Matsuba crab from Tottori Prefecture. This crab is internationally renowned for its fresh flavor and large size. The best place to find this crab is by going to Tottori, of course, but the crab is also distributed, so you will find it on the menus of restaurants across Japan. Fukui and Hokkaido prefectures are also known for their delectable crab. In addition to seafood, strawberries, mikan oranges, and yuzu are in season during this time. At many farms, you can go strawberry picking and find high-quality strawberries and unique varieties, like white strawberries. Citrus fruit like mikan oranges and yuzu-flavored foods are thought to be good for health and fighting off colds. Jogai Market, Sapporo: Come Eat Fresh Hokkaido Crab And Shrimp! Traditional Japanese festivities occur in the winter, just as they do during other times of the year. In particular, you can look forward to winter mochi pounding around the New Year holidays and Setsubun, a holiday welcoming spring, in early February. Setsubun festivals are in early February and are held at temples and shrines. In Tokyo, Sensoji Temple in Asakusa and Kanda Myojin near Akihabara have large-scale events featuring bean throwing (mame maki), which is meant to keep out evil spirits and bring in good luck. Both will be held on Feburary 3, 2019. 8. See the Dainty Plum Blossoms! Before the sakura season, the sweetly fragrant and delicate plum blossoms come into bloom in February. Known as "ume" in Japanese, these flowers are thought to be one of the first signals of winter ending. You can view plum blossoms throughout Japan, and there are also festivals held to commemorate the flower, too. In particular, Kairakuen in Ibaraki Prefecture is famous for its 3,000 plum trees that come into full bloom from mid-February to late March. This festival runs from February 16 to March 31, 2019. There are also areas in and around Tokyo where you can view these lovely flowers, like Setagaya Ward in Tokyo and Odawara in Kanagawa Prefecture. You can enjoy the plum blossom season will all five senses. Try the unique flavor of plum-inspired Japanese treats with tea, rice balls, and mochi. Limited-edition products will be often sold at festivals but can easily be found in supermarkets and convenience stores, too. 9. Shop Until You Drop! Picture from Shinsaibashi Shopping Guide – Fashion, Cosmetics, And Local Dishes In Osaka! The week after the New Year holidays is known for lucky bags (fukubukuro) and big discounts. However, sales continue to be held February and into March, when Japan’s fiscal year ends. Department stores and shopping malls in Japan are heated and will keep you warm and entertained during the chilly winter days. In Tokyo, neighborhoods like Shibuya, Shinjuku, and Ikebukuro will have many stores offering discounts. In Osaka, we suggest heading to Shinsaibashi to find sales. Be sure to keep an eye out for signs with information on deals and shop smart! You can celebrate two holidays dedicated to love in the winter in Japan. Valentine’s Day is on February 14 and White Day is on March 14. On Valentine’s Day, females typically give chocolates to males, and on White Day, males return the favor. However, it is also normal to give and receive chocolates amongst family and friends, so anyone is welcome to enjoy these holidays. Make sure to look for special themed chocolates and desserts. There are also a number of cafes and chocolate-specialty establishments in Japan where you can treat yourself to something sweet and seasonal. In Tokyo, Dandelion Chocolate is known for its high-quality chocolate bars and hot chocolate infused with Japanese green tea. Celebrate these holidays of love with special chocolate for yourself or with someone special. Visit Japan in the Winter! The coldest months out of the year in Japan are during winter, but this doesn't mean you can't make the most out of travel during this season. From indoor activities to nature, there is so much to see and do during this time. We hope you enjoy this magical time of year. Travel Economically By Highway Bus To Matsumoto, Takayama And Shirakawa-go!